Preheat oven to 350 F. Oil an 8 or 9 inch square pan. Alternately, line the pan with parchment paper (for easy removal). Mix all the crust ingredients in a mixer or food processor. It will look dry/crumbly. Transfer mixture into pan and press into an even layer, making the edges slightly higher than the rest. Bake for about 30-35 minutes, watching carefully. Remove it as soon as the edges are a bit golden brown. Let cool before adding filling (not sure if this matters). In a saucepan, combine the agar agar and water for 15 minutes. Place pan over medium heat and bring to a boil; boil about 10-12 minutes, stirring occasionally, until the agar has dissolved. Add the sugar and boil for 3 more minutes, until it has dissolved in the agar mixture. Combine lemon juice and starch, stirring until starch dissolves. Add to agar-sugar mixture and lower heat. Add lemon zest and coconut milk and whisk constantly, until mixture thickens a bit, about 5-7 minutes. It should be bubbling, but not wildly boiling. The mixture may not seem terribly thick, but more syrupy; this is OK, it will thicken as it cools. Pour the filling onto the crust; if some of the filling seems to seep under the crust, don’t worry, it will thicken and not affect the quality of the crust. Let cool for 20 minutes at room temperature, then refrigerate for 3-6 hours, until filling is set. 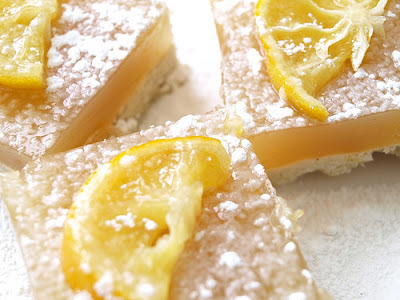 Top lemon bars with candied lemons and/or powdered sugar, if desired. Bars should be stored in refrigerator. Combine sugar and water in a medium saucepan and bring to a boil. Add lemon slices and simmer 15-20 minutes, until lemons become kind of translucent. Remove lemons from water and let ‘dry’ on wax paper. Store in refrigerator. Eat profusely. Use the remaining syrup to make lemonade, perhaps? *It looks like this recipe will work for limes too.